Trump appointee Joan Larsen was confirmed to the U.S. Court of Appeals for the 6th Circuit yesterday on a mostly party line vote. While all Republicans voted in favor of her confirmation, eight Democrats also voted for the notoriously anti-LGBTQ judge. 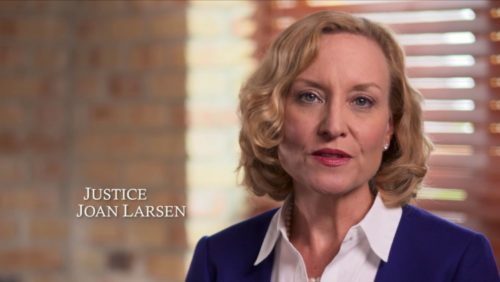 In a rare move of opposition, 27 LGBTQ organizations nationwide signed a joint letter highlighting Larsen’s troubling history of legislating from the bench and attacking LGBTQ families. Senators Tom Carper (D-DE), Joe Donnelly (D-IN), Heidi Heitkamp (D-ND), Joe Manchin (D-WV), Bill Nelson (D-FL), Gary Peters (D-MI), Debbie Stabenow (D-MI) and Mark Warner (D-VA), apparently didn’t care. Both Donnelly and Manchin have been opponents of LGBTQ rights previously but had given lip service to the party line in recent years. Stabenow, however, is normally considered an ally to LGBTQ people. Larsen sat on the Michigan Supreme Court, however, and both senators from Michigan voted in her favor. Throughout her career, Justice Larsen has written about and advocated for originalism. This view potentially calls into question her commitment to civil rights for African Americans, women’s rights, and LGBTQ rights since civil rights for these groups aren’t mentioned in the Constitution. The concern is exacerbated by Larsen’s vociferous praise of her former boss, Justice Scalia, who consistently ruled against voting rights, the right to choose, and granting even the most basic protections to LGBTQ individuals.